Is anyone else struggling with the temptation to stop at every pumpkin patch they pass on the side of the road? Even the mini displays in Bilo and Publix are catching my eye left and right. 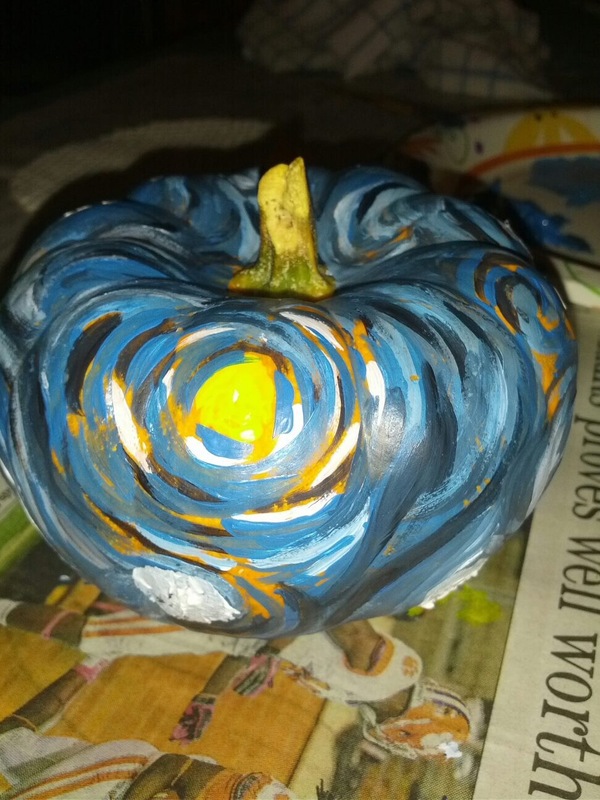 2) Painted Pumpkins: I’ve been a fan of painting pumpkins for a few years now. Usually I buy a few of the mini pumpkins each season and paint a new design. These last for weeks and can stretch well into your Thanksgiving decor. This was my own painted pumpkin from a few years ago. Excuse the poor lighting & newspaper backdrop. Pretty sure I took this photo at roughly 2am before the paint was even dry! Martha Stewart has posted a variety of tutorials and inspirational images for creating a painted pumpkin that suits your style. 3) This awesome pumpkin cake : I realize this isn’t made from pumpkins, but it looks like a pumpkin and is awesome. Think of the comments you could get at parties! Don’t you just want to dig right in? 4) Succulant Planters: If you follow me on Instagram you’ve seen that I’ve gotten a little plant-happy in the apartment. While this is great for indoor air quality, sometimes you need to jazz up your planters for something more seasonably appropriate. Better Homes and Gardens posted a super easy-to-follow tutorial on how to create these little beauties. Wouldn’t this be fabulous in the center of your dining room table? 5) Tissue Paper Pumpkins: this idea appealed to me because it would be such a fun craft to do with kids. You can’t go wrong with your designs and you still get your hands a little dirty. Gift of Curiousity posted this cute idea that came up on my Pinterest feed.